Once the great hope for his party’s foreign policy realists, these days he’s sounding more like a dyed-in-the-wool interventionist. Since his election to the U.S. Senate in 2010, the ever-dwindling number of foreign policy realists within the ranks of the Republican party have nurtured unrealistically high hopes for Dr. Rand Paul of Kentucky. Paul has certainly talked a good game, speaking out against arming the largely mythical “moderate” Syrian opposition and arguing against NATO’s disastrous intervention in Libya. And yet with the exception of Paul’s valiant 2013 filibuster against President Obama’s nomination of John Brennan for CIA Director, he hasn’t lived up to expectations. Not by a long shot. Troubling questions about his powers of discernment surfaced early on. In July, 2013 he was forced to part ways with his aide, a neo-confederate radio personality, Jack “the Southern Avenger” Hunter, who had boasted, among other things, that he raises a toast “every May 10 to celebrate John Wilkes Booth’s birthday.” Later that year, Paul and his staff were caught up in an embarrassing plagiarism scandal. Russia slides backward vainly hoping to resurrect the Soviet Union. Vladimir Putin justifies aggression in Ukraine as defense against decadent and hypocritical Western powers. In East Asia, Beijing extols the remarkable rise of China as the supremacy of a one-party state capitalism. In the Middle East, secular dictatorships have been replaced by the rise of radical jihadist movements, who in their beliefs and barbarity — represent the antithesis of liberal democracy. It was a speech that would have made both John McCain and Samantha Power proud. And this brings us to Paul’s lackluster performance at Thursday night’s Republican debate in Cleveland. 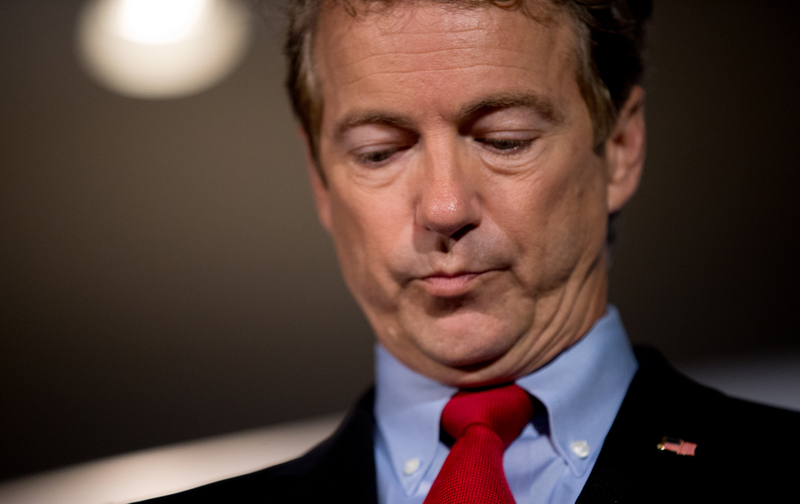 While Paul deserves credit for standing up to Donald Trump and Chris Christie, vainglorious blowhards both, his comments on the Iran deal should wake those remaining Republican realists up to the fact that Rand is not their man, and perhaps never really was. Worse, Paul doesn’t seem to understand the simple fact that unilateral American sanctions hardly ever influence the behavior of the regimes against which they are aimed. Paul’s ostensible concerns over sanctions relief simply serves as a fig leaf for the real reason behind his opposition to the deal: he wants to win over Republican primary voters. The immediate significance of his decision to oppose the deal is that it gets Congressional Republicans ever closer to their goal of securing a veto-proof majority for their resolution disapproving the deal. This is especially significant now that Sen. Chuck Schumer (D-NY) has decided to prioritize his donor base over his country by joining the ranks of the deal’s opponents. Yet there may be another significant ramification of Paul’s opposition to the deal: it may signal the death knell of foreign policy realism as a viable force within the Republican party. In point of fact, realism hasn’t had much purchase among Republican policymakers for nearly a quarter century. We are a long way from the days when Brent Scowcroft and James A. Baker were the principal foreign policy voices of the GOP. In the years since the first president Bush left office, neocons of the most messianic sort have had a stranglehold on the Republican party, to utterly disastrous effect. And while the Obama administration could hardly be said to be redoubt of realist thinking, its recent overture to Cuba and its willingness to work with other great powers in finding common ground over Iran’s nuclear program and Syria’s chemical weapons stockpiles, shows that there are indeed workable alternatives to military intervention. The idea that realists could (and should) abandon the GOP for the Democratic party should not strike us as radical departure. While realism is to all too often associated with the policies of Richard Nixon and Henry Kissinger, the leading lights of 20th century realism, men like Walter Lippmann, Hans Morgenthau, George F. Kennan, and Reinhold Niebuhr could hardly be described as having been in sympathy with the aims of the Republican party. Closer to our own time, Democrats as varied in stripe as former Carter National Security Advisor Zbigniew Brzezinski, Nation editor Katrina vanden Heuvel , former Carter speechwriter and journalist James Fallows, and current presidential contender Jim Webb espouse foreign policy views that are far more realist in content than anything the current crop of Republican candidates (to say nothing of their advisors) has to offer. Rand Paul’s ill-considered and opportunistic opposition to the Iran deal shows, if nothing else, that foreign policy realism is a spent force within the GOP.